I’ve received yet another threatening letter from Commercial Register and their so called ‘Legal Department’. Dated 07/10/2016 and received 11/10/2016, this letter informs me that Direct Publisher SLU are giving me a “final deadline of eight days”, failing which they will be “forced to forward the car to an international debt recovery agency”. 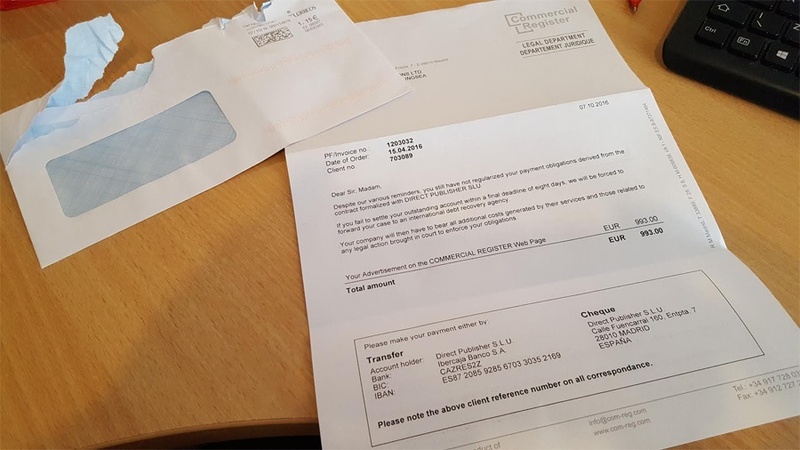 The letter also goes on to say that my company will “have to bear all additional costs generated by their services and those related to any legal action brought in court to enforce [my] obligations”. As usual, Direct Publisher are demanding €993 and requesting that I forward the money to their Ibercaja Banco S.A. account. And as usual, I have not intention of paying them. I have also been contacted today by a reader of my blog relating to the Commercial Register Scam, who has advised me to report this fraud to Royal Mail. Royal Mail operate a department which aims to prevent scam letters being delivered. The contributor, DC, has received a response from Royal Mail which says that will use the evidence to prevent further fraud mail. You can find our more about how to send a report of scam mail to Royal Mail here. I have also received this 8 day demand letter. I have reported to Action Fraud and have not engaged in ay correspondence with them. Have you heard anything further?